MultiSite Manager is a standalone software solution that allows you to remotely administer BackupAssist v8 and later computers over the internet. MultiSite Manager is installed onto the computer that will manage your BackupAssist computers. This computer will be the MultiSite Manager, and you will interface with it using a web application. All of the computers to be managed by the MultiSite Manager are grouped into sites. One computer in each site is made a Site Controller, which connects to the MultiSite Manager and communicates on behalf of its site. All other BackupAssist computers in the site are added to the Site Controller. MultiSite Manager can be used for both single-site and multi-site implementations. Single-site: each BackupAssist computer is connected to a single Site Controller, and that Site Controller is connected to the MultiSite Manager. Multiple Sites: each BackupAssist computer is connected to the Site Controller for their site. The Site Controllers are all connected to the MultiSite Manager. 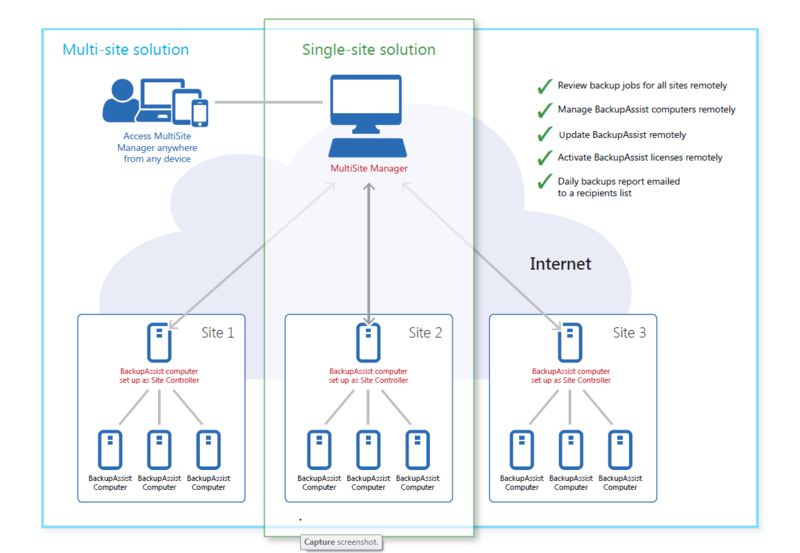 This graphic shows how a single-site solution is implemented—in the same way as a multi-site solution, but with just one site to manage. The Site Controller computer can also run MultiSite Manager if required. MultiSite Manager is installed and configured on a computer. It does not require BackupAssist. The Site Controller is a BackupAssist computer. It is registered to the MultiSite Manager using the BackupAssist Remote tab’s Remote Setup window. BackupAssist 9.2 and later computers are automatically detected by the Site Controller and added to the MultiSite Manager for remote management. BackupAssist MultiSite Manager is a standalone product that is sold separately from BackupAssist. There are different licensing and subscription requirements for the MultiSite Manager application and for the BackupAssist computers that are remotely administered. A Site Controller needs BackupAssist v8 and valid BackupCare (formerly Upgrade Protection). A BackupAssist computer needs BackupAssist v8 and valid BackupCare (formerly Upgrade Protection). You will no longer be able to access the MultiSite Manager web application and all email reports will stop. MultiSite Manager will still receive and retain updates from the BackupAssist computers, and when the license is renewed, MultiSite Manager will resume without any data loss. It will continue to function as a Site Controller, but the MultiSite Manager will display the Site Controller as an expired machine that cannot be remotely managed. The Site Controller’s own backup jobs will not be included in the email reports. The MultiSite Manager will list it as an expired machine that cannot be remotely managed - but its BackupCare subscription can be remotely renewed. The computer’s backup jobs will not be included in the email reports. 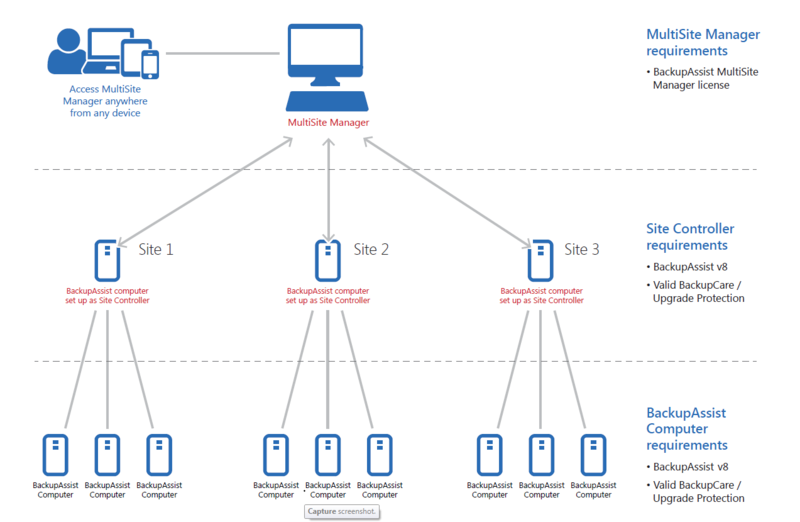 For a Multisite Manager solution, one computer in each site is nominated as the Site Controller, which will connect to the MultiSite Manager and communicate with the MultiSite Manager on behalf of a site. A site is a LAN containing all of the managed BackupAssist computers. This walkthrough explains the correct sequence of steps to implement a MultiSite Manager solution. Detailed information about these steps can be found in the MultiSite Manager setup guide. Select a computer to be your MultiSite Manager. This computer will need internet access, a globally reachable hostname or IP address and an SSL certificate assigned. MultiSite Manager can be installed onto a Site Controller, but the Site Controller will still need to be registered to the MultiSite Manager so that the computer can perform both roles. Install MultiSite Manager onto this computer and run the initial setup when you first launch the MultiSite Manager web application. This setup includes creating the username and password. These steps are performed on one computer in each site - the Site Controller. If there is only one BackupAssist computer in a site, that one computer will be the Site Controller. Select a BackupAssist computer to be the Site Controller for the site you want to set up. Install BackupAssist v8.1 or later onto the computer (if it’s not already running v8.1 or later). Run the BackupAssist Remote tab > Remote Setup. Select the Site Controller role and register the site to the MultiSite Manager. Open MultiSite Manager to approve the Site Controller registration. Enable the computer for remote management with the automatic registration option selected. Open MultiSite Manager, and go to the site that you are adding the computer to. Select the Site Installations menu and select Add Other Installations to Site. In the dialog box that opens, select the BackupAssist computer and click Add Selected to Site. If the Site Controller uses HTTPS on the LAN and the computer does not trust the certificate a manual registration must be performed using the steps in the MultiSite Manager solution setup section. If the Site Controller or managed computers are not using BackupAssist v9.2 or later, a manual registration must be performed using the steps in the MultiSite Manager solution setup section. Note: All computers managed by MultiSite Manager require BackupCare (formerly Upgrade Protection) and are therefore licensed for BackupAssist v8 or later.